Industrial PCs are a PC-based computing platform used in various industrial applications. Industrial PCs are especially designed to withstand harsh exterior environments (extremes of temperature, dust, humidity, vibration, power surges) that commercial PCs are not designed for. Industrial PCs are also more flexible as compared to normal PCs, as they support legacy applications that need to work flawlessly for 5 or even 10 and more years. This is because the components used for the manufacturing of industrial PCs are industrial grade rather than commercial grade. These are longer lasting and built to a higher standard. They have longer supported life durations and aren’t substituted by newer versions as often as commercial components. This provides higher consistency of supply and long-term repeatability so the same model can be available for much longer than the commercial equivalent. The revenue of the global industrial PC market stood at US$3,651.5 Mn in 2016; this is projected to expand at a CAGR of 10.7% during the forecast period (2017 to 2025) and reach US$8,784.2 Mn by 2025. The industrial PC market has been segmented on the basis of its type and end use. On the basis of type, the industrial PC market is categorized into panel industrial PC, box industrial PC, embedded industrial PC, DIN rail industrial PC, rack mount industrial PC, and thin client industrial PC. Panel industrial PCs are widely used across the industrial sector, as these are generally used for process control operations and data acquisition. Panel industrial PCs are used in the automation, manufacturing, surveillance, transportation, food and beverage, gaming, medical, communication and network infrastructure, retail, and energy and power sectors. At present, several major manufactures are in the process of developing embedded industrial PCs integrated with self-sensing capabilities for advanced data computing and realizing IoT applications. These are anticipated to be employed in industries such as manufacturing, automation, surveillance, transportation, and food and beverage. As a result, the demand for embedded industrial PCs is anticipated to remain high as compared to other industrial PCs. The global industrial PC market has witnessed traction across a number of sectors due to the high demand for robust PCs that can withstand severe environmental conditions. The leading applications of industrial PCs lie in communication and network infrastructure, digital signage, digital security and surveillance, energy and power, gaming, industrial automation and control, instrumentation/test automation, medical, aerospace and defense, retail automation, transportation, and others. The aerospace and defense industry requires industrial PCs capable of working at extreme temperatures (-20 degree Celsius to +65 degree Celsius) and extreme humidity levels (5% to 95%), and capable of withstanding corrosion, shocks, and heavy dust. The superior rugged design, combined with the best industrial-grade components, offers high reliability and long-term performance. This factor is expected to boost the market for Industrial PC over the forecast period. Europe was the largest revenue contributor to the industrial PCs market in 2016, with Europe being the hub for the majority of players in the market. The Europe and North America markets for industrial PCs were valued at US$1,280.5 mn and US$1,226.9 mn in 2016, respectively, and are likely to rise to US$2,576.2 mn and US$2,541.2 mn, respectively, by the end of 2025. However, Asia Pacific is expected to be an important market for industrial PCs market players in the coming years and is expected to exhibit a robust CAGR of 14.4% in the 2017-2025 forecast period. The valuation of the Asia Pacific market is likely to rise to US$2,777.4 mn by 2025, enabling steady dominance of the regional market in the coming years. In the Middle East and Africa, the UAE and Saudi Arabia cumulatively contributed around 57% of revenue in 2016 and are expected to hold the largest share in the Middle East and Africa industrial PC market in the forecast period. Leading manufacturers in the global industrial PC market are aggressively focusing on technological innovation by pouring huge investments in research and development activities. The competitive rivalry among these companies is expected to remain high over the forecast period. Several big players are engaged in the process of introducing more next-generation industrial PCs with smart energy solutions that can offer them a competitive edge over their competitors. Key players profiled in the report include Advantech Co., Ltd., Beckhoff Automation GmbH & Co. Kg, Bernecker + Rainer Industrie Elektronik Ges.m.b.H., Captec Ltd., Industrial PC, Inc., Kontron AG, Landitec Distribution GmbH, Lanner Electronics Incorporated, MiTAC International Corp., Mitsubishi Electric Corporation, Omron Corporation, Rockwell Automation, Inc., Siemens AG, and Schneider Electric S.E. Industrial PC is a ruggedized system designed to perform computing applications for various industries. Industrial PC is a PC-based computing podium mainly used for data acquisition or process control, and in some cases, it is simply used as a face off to another control computer placed in a separate processing environment. Industrial PC are precisely designed to survive typically severe environmental conditions. They have a flexible design to control, activate, and observe systems and machines on the plant floor. They provide a controlled environment for the installed electronics such that it is able to survive the typically rigorous conditions of the plant floor of any industry for a longer lifecycle. The emergence of Industry 4.0 and rising adoption of internet services and increased focus on efficiency and production cost play a significant role in the growth of the IoT market, which is favoring the specially designed industrial PCs market is driving the demand for industrial PCs globally are the major forces that drives the global industrial PC market. The Industrial PC market report provides an in-depth analysis of the global industrial PC market for the period 2017 – 2025, wherein 2016 is the base year and the years from 2017 to 2025 are the forecast period. Data for 2015 has been included as historical information. It also provides a comprehensive analysis of industrial PC market based on its type and different industries served. Based on the type, the market is segmented into Panel Industrial PC, Box Industrial PC, Embedded Industrial PC, DIN Rail Industrial PC, Rack Mount Industrial PC and Thin Client Industrial PC. Among the various end-use industry it serves, the Industrial PC market has been segmented into Communication and Network Infrastructure, Digital Signage, Digital Security and Surveillance, Energy and Power, Gaming, Industrial Automation and Control, Instrumentation/Test Automation, Medical, Aerospace and Defense, Retail Automation, Transportation and Others. The report includes a comprehensive coverage of the underlying economic development factors under the key trend analysis section. The report also covers that how various types of industrial PC’s are going to contribute to the growth of the Industrial PC market. This report is also depict the different end use industries contribution towards the growth of the industrial PC market. The report precisely covers all the major trends and technologies playing a major role in the industrial PC market growth over the forecast period 2017-2025. It also highlights the drivers, restraints and opportunities expected to influence the industrial PC market growth during the forecast period of 2017-2025. 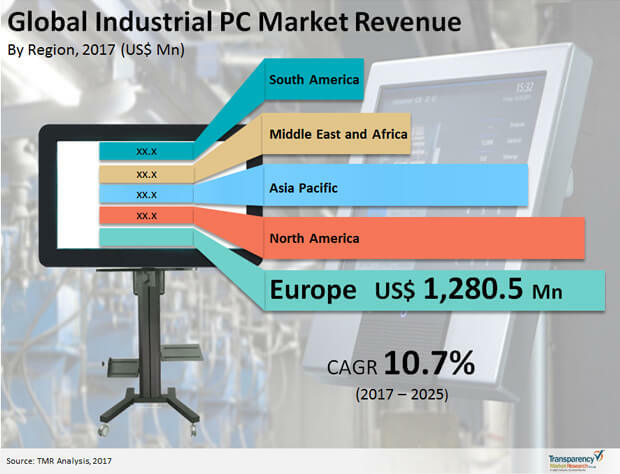 The study provides the holistic perspective on the Industrial PC market growth, throughout the above forecast period in terms of revenue (in US$ Million) across every region. The report also covers profiles of major players, their growth strategies, and the various recent developments. The objective of this study is to understand the factors aiding the growth of industrial PC market globally. The report further aims to identify various factors that are expected to support the expansion of industrial PC market. The report also provides value chain analysis and Porter’s five forces analysis for the industrial PC market. Market attractiveness analysis has also been provided for every segment in the report, in order to provide a thorough understanding of the overall scenario in the global industrial PC market. Major business strategies adopted by key players, market share analysis, SWOT analysis and product offerings have also been identified in the research report. The prominent service providers engaged in industrial PC market include Advantech Co., Ltd., Beckhoff Automation GmbH & Co. Kg, Bernecker + Rainer Industrie Elektronik Ges.m.b.H., Captec Ltd., Industrial PC, Inc., Kontron AG, Landitec Distribution GmbH, Lanner Electronics Incorporated, MiTAC International Corp., Mitsubishi Electric Corporation, Omron Corporation, Rockwell Automation, Inc., Siemens AG, and Schneider Electric S.E.